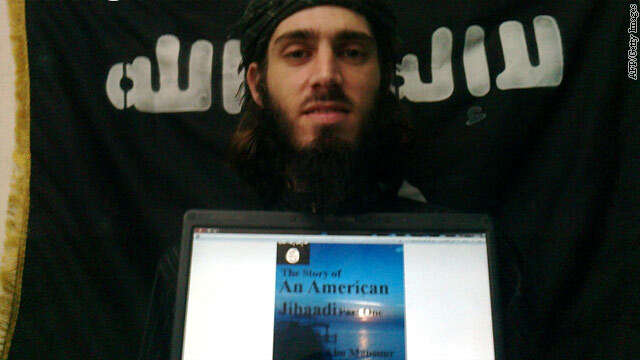 In this handout picture taken on May 23, 2012 and made available by IntelCenter, American extremist in Somalia's Al-Qaeda affiliated rebels Omar Hammami poses with the cover of his autobiography on a laptop was released to prove the authenticity of his autobiography in an undisclosed location. American Omar Hammami, who built a following in militant circles in the West for his idiosyncratic jihadist rap videos and had a U.S. bounty on his head, was among two notable jihadists reportedly killed in Somalia on Thursday. Sources said Hammami and Briton Osama al-Britani were apparently ambushed west of Mogadishu by members of al Qaeda affiliate Al-Shabaab. A message posted on the al-Jihad al-Alami forum said they were killed "by an unjust raid by the Emir of the Shabaab al-Mujahideen Movement and his followers in Islamic Bay and Bakool province after clashes that lasted for several hours while they defended themselves," according to a translation by the SITE intelligence group. Hammami, a former Al-Shabaab fighter and prolific English-language propagandist for the group with a $5 million American bounty on his head, went into hiding after falling out with the group last year. Hammami – who also goes by the name Abu Mansour al Amriki – has been falsely reported killed in the past and CNN cannot independently confirm his death. However John Berger, an American terrorism expert who has closely tracked Hammami and has recently communicated with him extensively online, believes that the latest reports are credible. "I'm pretty sure it's true. I saw it from sources close to Hammami and also from the Shabaab side, which hasn't happened before," Berger told CNN. The United States was working to confirm the report. "We have seen reports that Omar Al-Hammami, also known as "Al-Amriki," was killed in Somalia, and we are working to verify the reports," a State Department official said. Hammami released a bizarre internet video in March 2012 claiming the group was trying to assassinate him due to what he explained were "some differences that occurred between us regarding matters of the sharia and matters of strategy." One of his grievances appears to have been that he was passed over for promotion. Hammami's father is Syrian-born and his mother an American. He grew up in Daphne, Alabama, a suburb of Mobile. After his family moved to Egypt in 2006, Hammami left with a friend to join Al-Shabaab and quickly climbed the ranks as more foreign fighters converged on Somalia, especially young Somali-Americans. Subsequently he was indicted in federal court in the United States on terrorism charges. Following the release of his video, he railed against several high ranking figures in Al Shabaab, including its leader Moktar Abu Zubayr, on his Twitter account, in a self-published autobiography he released online, and in a series of online exchanges with Berger. He alleged that Al Shabaab leaders lived extravagant lifestyles from taxes imposed on Somalis, treated foreign fighters poorly, and lacked ambition to fight Jihad globally. He even accused Zubayr of having engineered the shooting of Fazul Mohammed, al Qaeda's leading operative in east Africa, by directing him to a Somali government checkpoint in Mogadishu where he was killed in June 2011. These accusations became a growing irritant to Al Shabaab. In January Hammami tweeted the group had issued an ultimatum that he surrender or be killed. In April, he posted a picture of himself with what he claimed was a gunshot wound in his neck from an attempted assassination attempt. By then, he had aligned himself with Sheikh Hassan Dahir Aweys, a powerful member of Al Shabaab's old guard and former head of the Islamic Courts Union, a militia which briefly took over much of Somalia in 2006. In June, Aweys surrendered to Somali authorities after reportedly defecting from the group after losing out in a power struggle with the younger and more harline Zubayr. Al Shabab has increasingly turned its guns inward since it was pushed out of Mogadishu and the lucrative port city of Kismayo after an offensive by Kenyan and Somali government troops. One of the sources of internal disagreement was Zubayr's decision to formally merge Al Shabaab with al Qaeda in February 2012 which caused discomfort to some powerful figures in Al Shabaab, including Aweis. Rivalry between different clans also increased tensions within the group. Despite losing ground, Al Shabaab has remained a threat inside Somalia. Last week, it claimed responsibility for bombing a restaurant in Mogadishu popular with westerners killing more than a dozen people. Several Americans are still believed to belong to the group. These include Jehad Serwan Mostafa, who also has a $5 million U.S. price tag on his head and who sources tell CNN has risen to a leadership position in the group. Hammami gave an interview last week to Voice of America's Somali service in which he renewed his attack on Zubayr. It may have been the final straw for Al Shabaab's commander. Hammami not only claimed Zubayr was trying to have him killed but depicted him as an oppressor of Muslims. Hammami said in the interview that he was hiding in a forested area after Al Shabaab fighters arrested both of his wives and killed a person who had arranged a safe house for them. "I'm openly not from Shabaab, I'm openly not from al-Qaeda, but I'm definitely a terrorist," he said, adding he would only come back to the United States "in a body bag." Just wondering here... but has anyone ever thought that perhaps some of these "American Jihadis" are US spies infiltrating the terrorist networks? Which could possibly explain why their own groups killed them? Not saying this guy was, because no one but the highest levels of government would know this truth. Just something to think about. I think that if we have to consider all the possibilities of everything in life as more than it is then we would all go mad. Then we could come up with questions like, perhaps america was never going to attack syria anyway since they had an agreement worked out in advance with russia to propose a solution so that both sides save face in case chemical attack while removing the chemicals from the battlefield. Or that Iran was never an enemy of America since America and Iran has an understanding that ramping up tension is great for weapons production and sales and Iran is selling secrets to America about allies that confide in them. So American looks like they are protecting the world and Iran has the support of their civilians against the evil Americans. Or the supposed leaks about the NSA is staged to reveal a bit of the reach the NSA has, while hiding the big truth. Give someone a bit of truth to satisfy them as if it is a big revelation to keep the actual big secret safe. Anyway, you could seriously go mental thinking of all possibilities. So is ALL regligion. PERIOD! Miss America 2013 is of Indian origin and a hindu. You are a bigoted, uneducated moron. American jihadi reportedly killed in Somalia. Praise Alha. Poor guy lured into terrorism only to get death from the group for which he had sacrificed his all things. He is definitely someone who was misguided. He could not analyze that his choice would only increase the brutality practiced by criminals in the name of this thing or that thing. A person who has such son is the most unhappy creature in the earth. He could not choose the correct path. A couple of months ago I had read this guy's father's interview where he feared the incidents which now occurred. No punishment is sufficient for those criminals who would lure innocent youths or kids to wage " Jihad " for their vested interests. Actually the first time I looked at the main picture in this article I thought he was wearing a moose hat. Hey Natasha!!! Get Moose and Squirrel!!! If Obama had a son it would look like him. PSYCHIATRIC PATIENTS TRYING TO ELIMINATE THEM HEAR VOICES OF AGENCIES IN DIFFERENT PLACES ON ALL AGENCIES. SWISS, ITALIAN AND THE VATICAN. WE ARE LEAVING TO CONNECT THROUGH DIFFERENT U.S. SATELLITE IN EUROPE. PSYCHIATRIC PASIENTES TRYING TO ELIMINATE THEM THAT HEAR VOICES OF AGENCIES IN DIFFERENT PLACES ON ALL AGENCIES. I am sure he is busy right now entertaining Allah with his creative songs. and Allah is probably scratching his head with expression on his face " What the F is that?" Who let this dumb American in my palace !! I DONT MISS THIS DEAD" MUSKILLIUM". He should never have written his autobiography, well at least we know how it ends. True human islamic trash. I'm sure he's enjoying Hell. Al Amriki, to funny. These guys have great imaginations I mean how did they get that name? It probably took weeks. He more than likely had a secret hideout with a big sign that said secret hideout. One less poser to worry about, they really do have to find the recruiter though and then make him disappear. You must be to young too remember when it was 40 virgins and before that it was 20 virgins. Terrorists love too lie and be lied too just think of Putin. "some differences that occurred between us regarding matters of the sharia and matters of strategy." Good riddance to bad rubbish.May he rot in hell. well sounds like it was a case of dog killed by dogs. Did they eat his heart? He was probably killed when they found out he was a CIA operative posing as a terrorist. exactly...–this is how it klooks like ! no reason to worry; his body is probably eaten already by his starving Somali friends. What's a "notable jihadist", as stated in the article"
I'm openly not from Shabaab, I'm openly not from al-Qaeda, but I'm definitely a terrorist," he said, adding he would only come back to the United States "in a body bag. Except his family won't bring him back for burial.